participate in one of the oldest and best sports in the world. School – Section II and Brian Tompkins – Sleepy Hollow High School – Section I. In addition, this year the Upstate New York Chapter will present Rear Admiral Donald P. Quinn the Outstanding American Award. Michael Carey will be presented with the annual Stanbro Media Award for his work promoting wrestling in Section IX and New York State. The 2019 NYSPHSAA Wrestling Championships are officially in the books and Section 9 had a great showing. 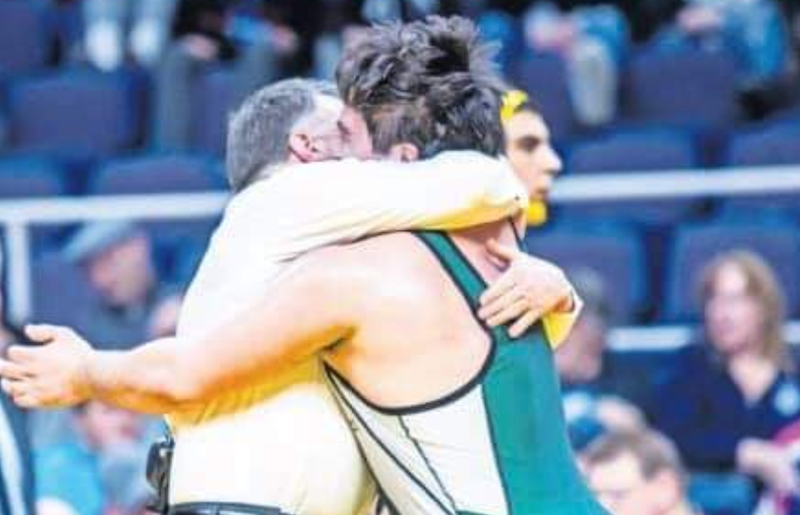 There are several things to discuss, however without question the highlight of the tournament from a local perspective occurred at 220 pounds where Cornwall senior Will Leonard won a state title in the last match ever coached by Hall of Famer Don Blaine. Leonard, who finished the season 45-0, had to battle for each of his four victories on his way to the title. Leonard started with a 4-2 win over Nolan Thomas in the opening round and followed that up with a 4-2 utb win over Emre Mabocoglu in the quarters. Leonard then went onto beat Dequan Stewart from Section 8 Roosevelt 2-1 in the semis before setting the stage for his dramatic 6-1 victory over Section 4’s Lucas Scott in the finals. Leonard and Scott were tied 1-1 when the Cornwall start scored a take down and picked up near fall points in the closing seconds on the match! On behalf of the entire Section 9 wrestling community I would like to say “congratulations” and “thank you” to Will. Congratulations for winning a state title….and thank you for sending off Coach Blaine in style! There is nobody more deserving! The 2019 tournament was an extremely successful year for the Section 9 team! Our local contingent finished with a total of 12 state medals including 5 for our small school division – our highest total ever! And what’s even more exciting – 9 of the 12 medalists are underclassmen! Let’s look at look at each state place winner. As described above, Leonard finished his senior season a perfect 45-0 and was crowned champion at 220 pounds. Leonard also won the Eastern States Classic in January. The Minisink Valley middle schooler almost shocked the nation! After pinning his first two opponents and winning comfortably in the semis against a returning state finalist, Ryder lost a heartbreaking 4-3 decision in the finals to Stevo Poulin from Section 2. Poulin, a sophomore at Shenendehowa, was a state champion last year, a 2X ESC champion, and is ranked #2 in the nation by FloWrestling! Congratulations Zack – you have an amazing future ahead of you! Ross’s 3rd trip to the state tournament was a memorable one as the Onteora sophomore went 5-1 and took home the bronze at 138. Ross won his opening match 8-6 before falling 13-2 in the quarters to eventual finalist John Worthing. Ross then rattled off 4 straight wins including 2 pins to finish 3rd! Great job Nick! The NFA junior accomplished one of the hardest things to do in the sport of wrestling – he lost his first match and then wrestled all the way back to 3rd place! DeCapua, who placed 6th at this tournament last season, was pinned in his opening round match on Friday at 5:19. Rather than letting is get the best of him mentally, DeCapua put his nose to the grindstone and rolled off 5 straight wins and finished 3rd! Two of the wins were sudden victor wins – you showed tremendous heart Maxx! Congratulations! The 145 was considered by many to be one of the toughest weight classes in this year’s state tournament -Askey was not phased one bit! The Pine Bush junior won his opening match 10-5 before dropping a hard fought 8-5 decision to eventual champ AJ Kovacs in the quarters. Askey followed up with wins over Aiden Poe, Brock Delsignore, and Lee Mauras before losing 9-3 in his medal match to Kris Ketchum. Congratulation Tommy…awesome job!!! When the brackets were released last week, McGinty was unseeded at 152 and had a brutal draw. The Monroe Woodbury junior responded by knocking off the #5 seed Joe Simons in the R16 and #4 seed Ty Raines in the quarters before losing to the #1 seed in sudden victory overtime! McGinty then defeated the #3 seed in the consie semis before dropping his medal match to Raines 3-1. Congrats Joey – great job this weekend! The Highland senior made his final trip to the state tournament a memorable one by advancing all the way to the semifinals and finishing in 5th place! Malherio, who came into the tournament as the 6th seed, started off by defeating Malachi Porter in the opening round before picking off the #3 seed Mike O’Brien in the quarters by a score of 1-0. Malherio then dropped a close 8-6 decision to the #2 seed Perlleshi fore wrestling back to 5th. Congratulations on a great tournament and a great career Mat! Along with the aforementioned Malherio, the 3rd seeded Oosterom was the second Section 9 D2 wrestler to advance to the semifinals. The Port Jervis junior defeated Sterling Spoon in the R16 before decking Alex Thompson from Section 3 in the quarters in 1:31. Oosterom lost his semifinal match but did pick up a win in his medal match over Connor Sykora from Section 5! Well done James! Being perhaps the smallest 285 pounder in the tournament did not scare Fenner at all! The Minisink Valley sophomore finished 4-2 for the weekend and walked away with a 5th place finish! Fenner won his opening match but lost in the quarters to eventual third place finisher Burns from Hilton. He then knocked off Mena from Section 2 in a wrestle back before notching an impressive 6-2 overtime win over 2nd seeded Jacob Stangle in the blood round. Fenner then lost his consie semi and won his medal match on his way to a 5th place finish! Congratulations Adam!! Morris went 0-2 in Albany last year but the experience definitely paid off because this year the Red Hook junior left with a medal around his neck! Morris dropped his first match to DeLia from S11 then reeled off three straight wins in the consies before narrowly losing to Delia again in the consi semis 4-2. In his medal match Morris was defeated 9-8 by Section 4’s Kyle Willard who was a semifinalist this year. Congratulations Matt – job well done! Along with 145, the 120 pound weight class was considered among the deepest in this year’s tournament! Vespa, who finished 3rd in NYS last season and 4th the season before, wrestled very well and still only finished in 6th place! Vespa pinned his opening round opponent before dropping a heart-breaker to Ivan Garcia 3-2 utb in the quarters. Marco wrestled back well notching wins over two tough wrestlers, CJ Lee and Kole Mulhauser to guarantee his top-6 finish before losing two straight matches to seeded wrestlers and finishing 6th! Congrats Marco on a great season and a phenomenal career! It was a great weekend for the Ross brothers as Nate made it 2 for 2 with state medals! Nate really grinded this weekend! He lost his opening match 10-8 to Logan Duers from Section 2 and then had to run off three straight wins to get back to the medal rounds. Ross then ran into the #3 and #4 seeds, Putney and Campo, and left Albany with a 6th place finish! Congratulations and great job Nate! Chenier’s first trip to the state tournament was a success as the Kingston junior left with some hardware! Chenier won his opening match but lost in the quarters. He then won a wrestleback match before losing in the blood round. However since there was a non NYSPHSAA finisher above him (Adams from CHSAA), the tournament recognizes the top 8 finishers! Great job Jacob!!! Let’s extend a huge congratulations to one of the icons of Section 9 Wrestling, Wayne Carroll! Wayne has been inducted into the NYS Wrestling Hall of Fame for his dedication and service to the sport which spans over 50 years! Carroll graduated from Goshen High School where he was a decorated wrestler including a 5th place finish in NYS in 1975. Wayne went on to have an extremely successful college wrestling career at East Stroudsburg and also coached for 10 years. However it is without question that Wayne is most know in the wrestling community for his work as an official. Wayne has served the state as an official for 38 years! He was ranked as the top official in Section 9 an incredible 15 times! Carroll is also a member of the National Wrestling Hall of Fame. Congratulations Wayne! Just a few other nuggets of info…. Eastport South Manor senior Adam Busiello became only the 3rd wrestler in NYS history to win 5 state championships. Busiello joins Troy Nickerson and Jacori Teemer in this rarefied air. Busiello finished his career with an astonishing 299 wins! Section 5 won the D1 tournament breaking Section 11’s 10-year stranglehold on the sectional team title. They went 5 for 6 in the finals and one of the teams from Section 5, Hilton, had FOUR state champions! 2019 NYSPHSAA Wrestling Championships – FINALS!!!! 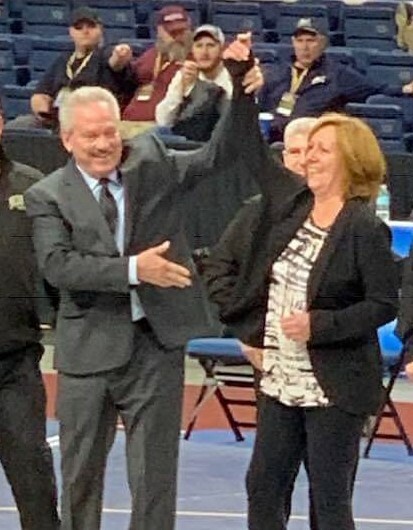 Posted on February 23, 2019 February 24, 2019 Author Mike CareyCategories Uncategorized1 Comment on 2019 NYSPHSAA Wrestling Championships – FINALS!!!! Saturday morning is always the most exciting round of the tournament! In the center mats we will have the semifinals…on the outer mats we will see the “blood rounds” … for those new to the sport, the blood round is the round where the winners are guaranteed a spot on the podium – the losing is eliminated! Let’s take a look at the Section 9 wrestlers still alive at the 2019 NYSPHSAA Championships! 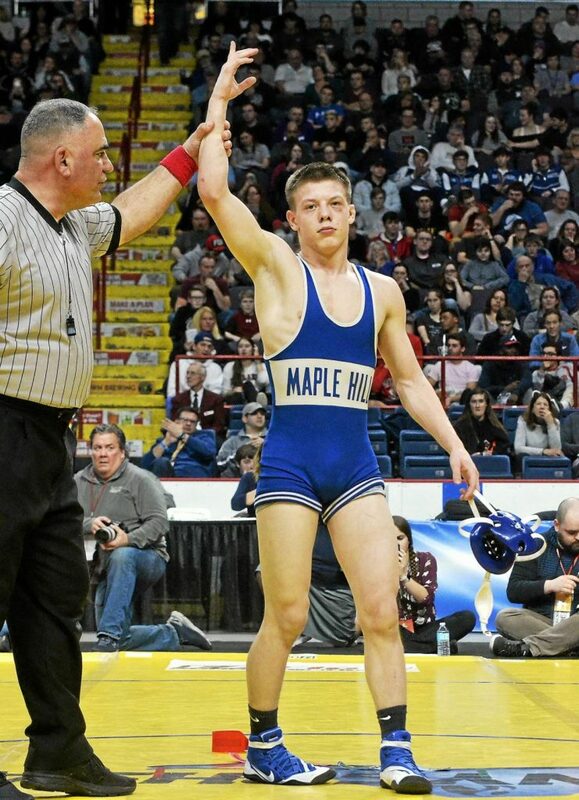 Let’s take a look at how our local wrestlers did during Day 1 of the 2019 NYSPHSAA Wrestling Championships. 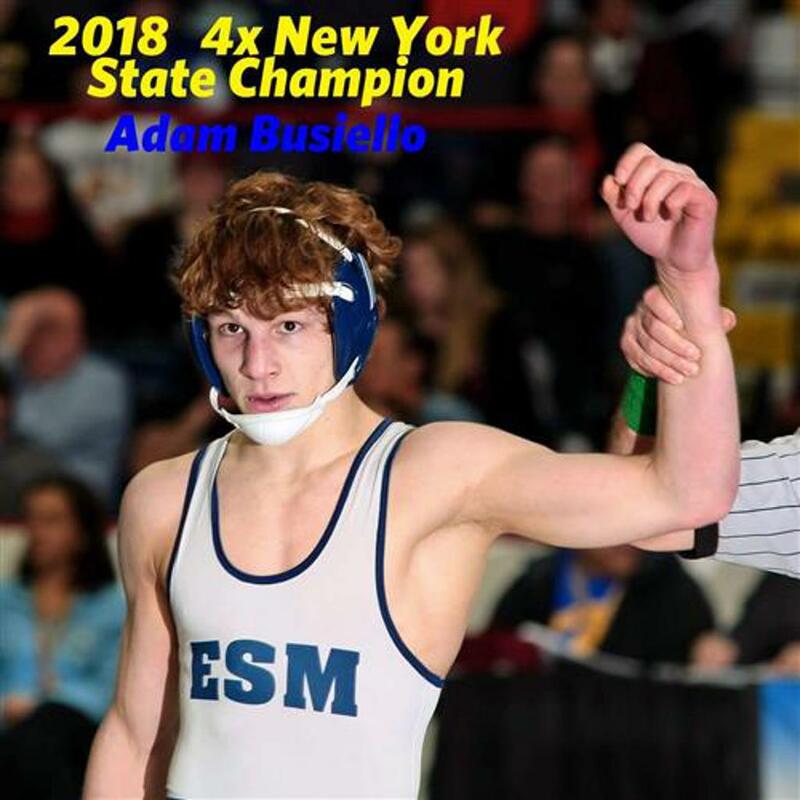 Eastport South Manor senior Adam Busiello seeks to become only the 3rd wrestler in NYS history to become a 5X state champion. Busiello looks to join Troy Nickerson (Chenango Forks, 2001-2005) and Jacori Teemer (Long Beach, 2014-2018) as the only three wrestlers in state history to achieve this incredible accomplishment. Busiello will be wrestling at 138 pounds this weekend and will definitely be tested. His biggest test will likely come in the finals in an anticipated showdown with Willie McDougald from Niagara Falls. McDougald, a junior, won the 132 pound state champion last year by defeating another state champion, Justin Vines, in the finals. Can McDougald knock off another state champion? Busiello and McDougald met in the Eastern States Classic finals in January where Busiello won by a razor close 3-2 decision. If the seeds play out at 138, a Busiello vs McDougald II would be the most anticipates match of the tournament. Will Section 11 Continue to Dominate? Section 11 (Suffolk County) has won the sectional team race for the last 10 years at the NYSPHSAA wrestling tournament! Yes, 10 straight years! Is this the year that the streak will end? Although they are extremely strong in several weight classes and will inevitably win a few titles, it can be argued that there are two sections that have shot at taking top honors this year. Section 5 (Rochester area) is definitely one of the teams in the hunt. They probably will not crown as many champs as S11 but they have a very solid team this year and could possibly have the most top-4 place winners. Section 8 (Nassau County) will also be in the mix. Similar to S5 they will not crown as many champs as Suffolk but they have a let of depth and could possibly chase after the team tile by Saturday night! The Catholic High School Athletic Association is bringing a strong contingent to Albany this year! Since they have joined the tournament, the CHSAA has had 9 champions – Andrew Lenzi 2X, Richard Sisti 2X, Robert Murphy, Lucas Magnani, Grant Greene, Jamel Hudson, and Terry Adams. This year, however, could be the first time that the CHSAA has every crowned 2 champions in one year! They are strong at several weights but let’s pay extra attention to James Ryan (Monsignor Farrell) at 120, Preston Maucere (St. Anthony’s) at 132, and AJ Kovacs (Iona Prep) at 145. All three wrestlers are absolute hammers and it would surprise very few people if one, two, or all three are wearing a gold medal on Saturday night! This section will be completed after the tournament. 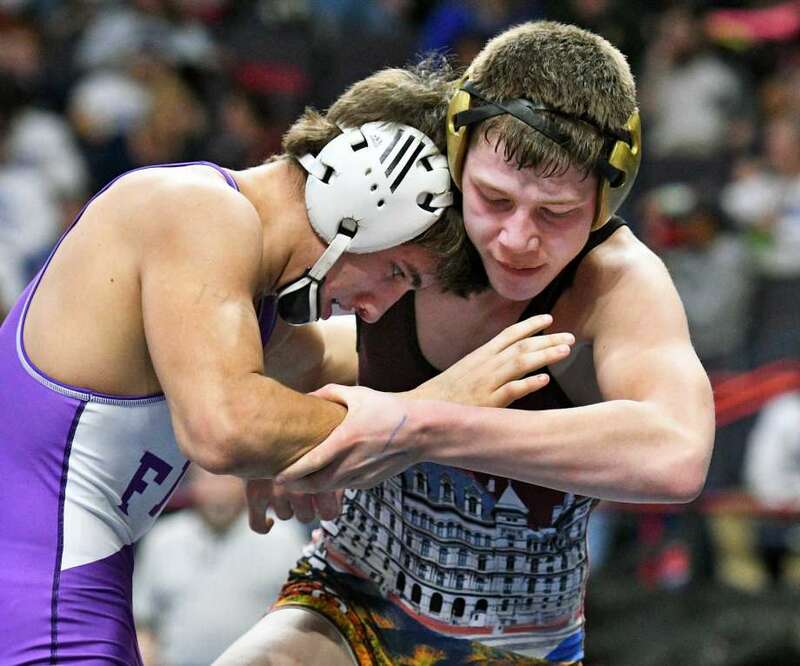 Each year at the completion of the state tournament, the Friends of Section 9 will analyze the results of both the Eastern States Classic and the NYSPHSAA Championships. The correlation is typically mind blowing! For now, we know that 20 of the 30 #1 seeds in the state tournament finished in the top 3 at the ESC. Steel sharpens steel! To be continued…. The New York State Sportswriters Association has released it’s final team rankings for the 2018-2019 season and the Minisink Valley Warriors have been recognized as #3 in NYS! This is an absolutely amazing accomplishment considering the Warriors graduated 6 Section 9 champions last season….not too bad for a “rebuilding” year! The is the sixth year in a row that Minisink has finished in the top 10 in the state! The future looks very bright for Minisink too considering they are only losing 3 starters to graduation! Congratulations to Coaches Gallagher, Hendershot, Potter, and Byrne, and to the rest of the Minisink Valley wrestling program which includes their outstanding Mat Maids program lead by Michelle Fenner! Let’s also extend out congratulations to the Monroe Woodbury and Eldred/Liberty/Sullivan West wrestling programs for also being recognized by the NYSSWA! The Crusaders finished 15th in the Division 1 rankings and E/L/SW was ranked 23rd among small schools. Several other Section 9 team received honorable mention recognition. Click on the link below for the complete list. Now let’s check out a weight-by-weight breakdown of the small schools! The 2019 NYSPHSAA Championships will take place on Friday 2/22 and Saturday 2/23 at the Times Union Center in Albany, NY. Best of luck to all of the competitors! With a nice blend of youth and experience, the lightweights will be fun to watch in the D2 tournament. Top seeded Jace Schafer from Section 5 finished 5th in Albany last season but is looking to win it all this year. The Pal-Mac sophomore is 51-3 this year and all of his losses have been close decisions to D1 studs McNeil (2X) and Conetta. 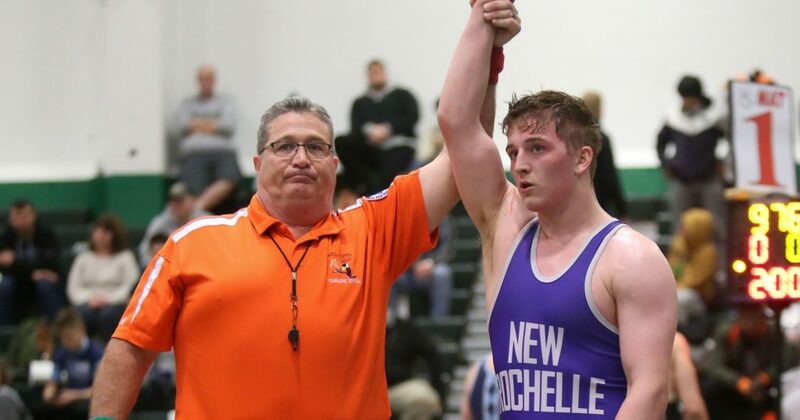 Schafer also has a few wins over wrestlers in his bracket including the kid he beat out for 5th/6th in Albany last year, Andy Lucinski from Section 6 Newfane. 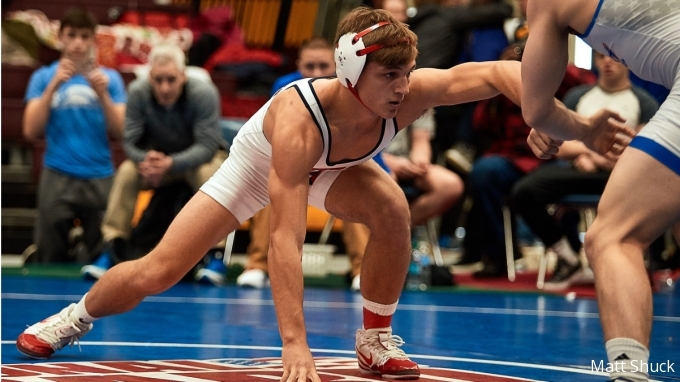 Lucinski is 38-2 this year and would love to wrestle Schafer again – this time for the title! Second seed Sixx Cook from Central Valley Academy is having a great season and will definitely be competitive here as will Matt Gatto from PSAL Petrides who is sporting a 36-4 record. Long Island has two tough wrestlers entered here in Max Gallagher from Section 11 and Jackson Polo from Section 8. Trevor Tufano from Port Jervis is making his first trip to Albany and will definitely gain some valuable experience. Dante Geislinger from Section 4 Norwich was the 99 pound Division 2 state champ last year. He is the top seed and favorite to bring home title #2 on Saturday. Geislinger is 36-3 this year and was a finalist at the Eastern States Classic where he was defeated by nationally ranked Stevo Poulin. However we shouldn’t expect Geislinger to run away with the title this year! On the bottom half of the bracket lurk a few wrestlers looking to pick off the top seed namely Muskan Monger and Caleb Svingala. Monger, a senior from Warsaw, is having a great season including a strong showing at ESC where he lost a narrow 5-4 decision to Geislinger. Monger also majored the #2 seed Joe Sparacio from Section 11 by a score of 10-1 at the ESC. Svingala is making his 2nd trip to the state tournament and is primed to step onto the podium this season. The junior from Section 2 Maple Hill is 40-1 on the season with his lone loss coming to Avery Leonard who is also in this bracket. Leonard, a sophomore from Section 3 Cooperstown, is 44-4 and suffered 3 of his 4 losses at the Eastern States Classic – Geislinger, Ryder, and Camillaci. We can’t forget about David Ball from Section 6 Gowanga who is a perfect 33-0 thus far this season. 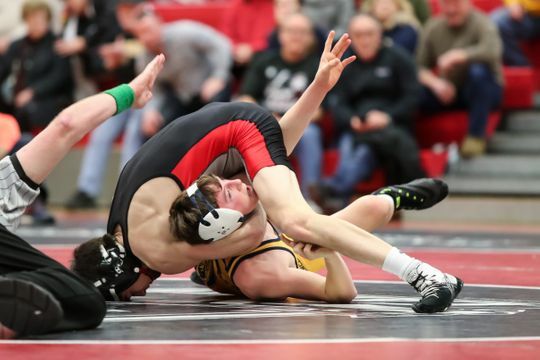 Section 9 entry Peter Bender from Highland has an outbracket match against one of the other wrestlers to watch here, Nicholas Noto from Honeoye Falls – Lima. Noto received a wildcard to the state tournament after narrowly losing a 1-0 decision to Monger in the Section 5 finals! The 113 pound weight class has no shortage of talented wrestlers but the clear favorite here is 2X NYS champ Anthony Noto from Section 5. Noto, a junior from Honeoye Falls – Lima, is having another incredible season! His record this year is 35-1 and his only loss was a 5-2 decision in the finals of the Eastern States Classic to nationally ranked Greg Diakomihalis. There are a few wrestlers in this bracket who will definitely push Noto! Micah Roes from Section 3 Lowville, who placed 4th in NYS last year, gave Noto all he could handle losing a close 10-8 decision to him in the ESC quarterfinals. In the same tournament, Roes defeated 2018 D1 state champ Terry Adams but also dropped a decision to Mason Bush from Central Valley, the 3rd seed in this bracket! Bush placed 3rd in NYS last season at 99 pounds. A few other who we definitely need to keep an eye on here are Joey Scheeren from Galway who is 33-1, Rick Delia from Port Jefferson who is 34-2, Jake Murphy from Seaford who is 31-3, and Cody Merwin from Walton who is 38-3. Section 9 champ Matt Morris is making his second trip to the state tournament and definitely has his sights set on the podium! This is without question going to be one of the best weight classes to follow in the entire tournament! 120 is loaded with talent – exactly the way one can describe the top seed here, Jordan Titus from Section 11. 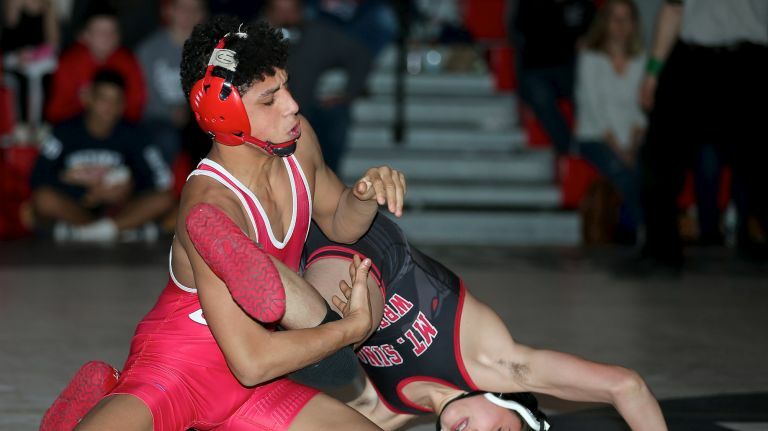 The sophomore from Center Moriches HS has been runner up to Anthony Noto at the last two state tournaments but this year is looking to ascent to the top step. He is 36-1 with his only loss coming at the ESC semifinals to Noto at 113. Titus has also notched a great win this season over Division 1 stud Sean Carter. As mentioned however, there is plenty of talent here to push Titus. Caleb Robinson from Section 4 Walton is the #2 seed and he’s as tough as they come. He finished 4th at ESC and posted a win over Matt Garland from Section 3 who is also in this bracket. Garland finished 3rd in NYS last season. One of the wrestlers who defeated Robinson at ESC was Carter Schubert from Section 5. Schubert, who finished 4th in NYS last year, is 38-5 this year and is seeded 4th. Garland defeated Schubert 1-0 at Eastern States. A few others to watch here are Len Balducci from Section 1 who finished 3rd in NYS last year and Joe Costantano from Section 8 who is no stranger to Albany! Liam Bullock from Section 9 has had a great year and could surprise some people this weekend as could Jack Bosco from Hackley! With a NYS champ, a NYS 2nd, a NYS 3rd , and a NYS 5th in the bracket, the 126 pound weight class will definitely be one to watch closely! Marek Bush was the Division 2 113 pound state champ last season and he is having another very strong year – however he is the #4 seed here! Why? Well at the Eastern States Classic Bush actually has lost to two of the wrestlers in this bracket this season! One of those losses came to to the wrestler he defeated in the state finals last year, Chandler Merwin from Walton. Merwin is the top seed here and is sporting a 39-5 record. Bush also lost twice at ESC to Bradley Cheek from Section 5 Canisteo Greenwood who is 45-3 on the season and placed 5th in NYS last year. Peru senior Logan Dubuque is the #3 seed at this weight. The Section 7 champ is 30-4 this season and he placed 3rd in NYS last season. The depth in this bracket doesn’t stop there. Aiden Cullen from Section 2 and Dean Shambo from Section 3 will definitely be in the medal hunt here as will Section 9 champ Eric Tigue who was a win away from placing in Albany last season. Trent Svingala from Section 2 Maple Hill is a 2X NYS champion. He is the top seed and is the favorite to win title #3 this weekend. Svingala, who is heading to Columbia in the fall, is 42-0 this season with 41 of his decisions coming via pin or tech fall. (His other win was a 14-point major decision.) However Svingala will not go untested! The #2 seed here is Victor Perlleshi from Section 1 Pleasantville. Perlleshi is 40-1 with his lone loss coming in the finals of the ESC – a 5-2 decision to Justin McDougald who is the top seed at 132 in Division 1. At ESC Perlleshi also defeated one of the other contenders here in Greg DeNatale from Section 8 Locust Valley. DeNatale is 34-2 and his only other loss came to Lincoln Heck from Wyoming Seminary. Another Long Island wrestler, Mike O’Brien from Section 11 will definitely be in the hunt here! O’Brien 38-5 this season but his only loss to a wrestler in this field was a 7-3 decision to Perlleshi. 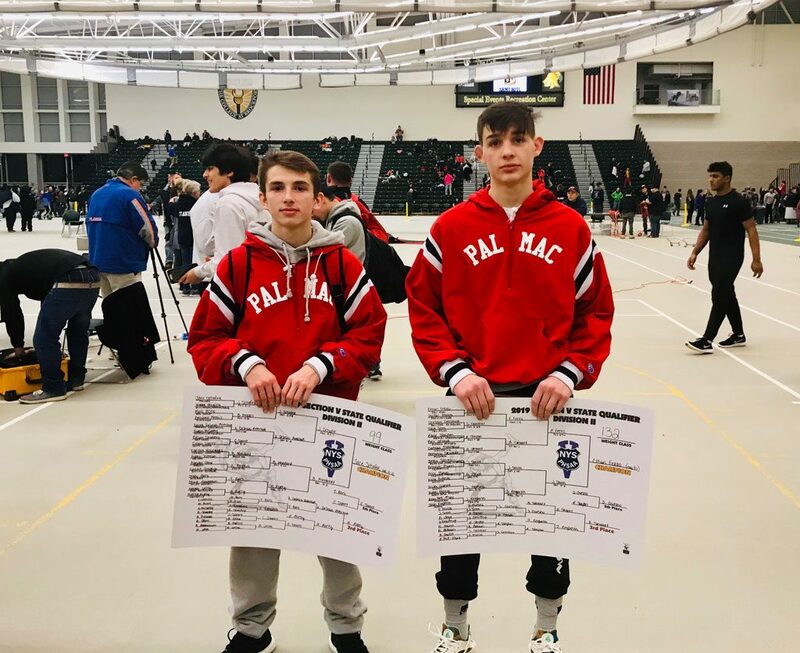 A few others to keep an eye on here are Ethan Ferro from Pal Mac who is 50-3 and Section 9 champ Mat Malherio who is making his third trip to Albany! This weight class is wide open! 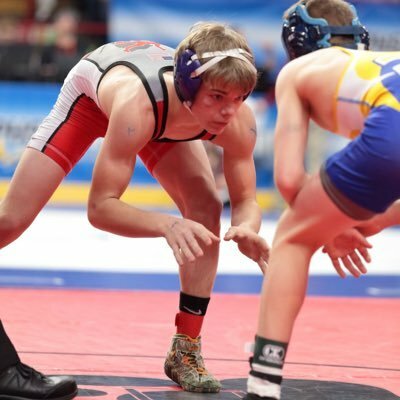 Top seeded Zach Bradell from Section 6 Tonawanda finished 3rd in NYS at 126 last season and is definitely one of the pre-tournament favorites. He is 36-4 this season and all of his losses are to D1 studs. Braddell was pushed to the limit in his Section 6 final where he edged out Dalton Gardner by a score of 2-1. Gardner received a wildcard and will definitely contend here as will John Worthing from Section 4 Tioga. Worthing is 35-3 this year and he’s the 2nd seed in this bracket. One of his losses however was in the Section 4 final to Brody Oleksak from BGAH. Oleksak has a 38-2 record this year and both of his losses are to….you guessed it, John Worthing! One of the other wrestlers to watch here is Kadin Peryea from Beekmantown in Section 7. Peryea is a perfect 38-0 this season! Section 2 has two seeded wrestlers in this bracket in Alec Richards from Corinth and Greg Hotaling from Colbeskill. Section 9 champ Nick Ross has a 43-3 record this year and has been to Albany before; he could definitely contend here. We should also keep an eye on Joe O’Brein from Section 11 and Michael Leandrou from Section 8. Just like the 145 Division 1 bracket, the 145 Division 2 bracket is absolutely loaded! There are at least a half of a dozen wrestlers who have a legitimate chance of winning here. Let’s start with the top seed and multiple time state place winner Cahal Donovan from Section 3. The Marcellus senior is 31-2 this season and both of his losses were at the Eastern States Classic. One of those losses was a 6-2 loss to ESC champ Tyler Sung and the other was by medical forfeit to Brock Delsignore. One of Donovan’s closest victories was in the Section 3 final where he defeated former state champ Hunter Shaut from Central Valley Academy by a score of 3-1. Shaut received an at-large bid to the tournament and is the #2 seed here. Do not be surprised if we see a Donovan/Shaut rematch on Saturday night! In order for this to happen, however, both wrestlers will have to topple some very tough competition. 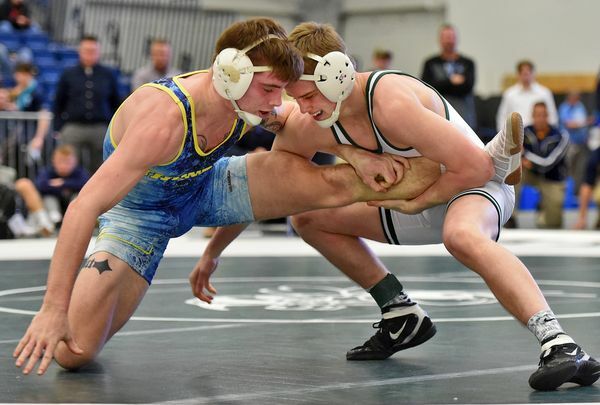 Chase Runfola from Section 5 is a perfect 44-0 this season and let’s not forget about Austin Lamb from Section 4 Tioga who placed 5th in NYS last year and is 42-1 this season. Lamb’s only loss this season was a 3-1 decision up at 152 to D1 hammer Warren McDougald. Others who will be in the mix for a title here are Raymond Costa from Cold Spring Harbor and Jimmy Kramer from Falconer – neither have a “bad” loss on there ledger this season! 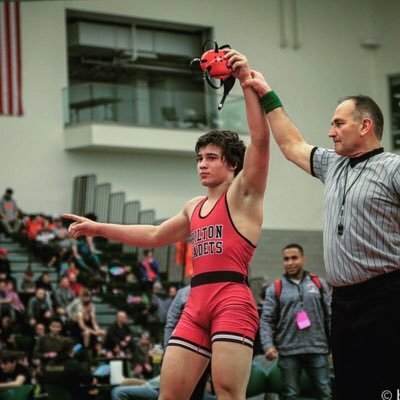 Section 9 champ Nick Curreri is having a great season and should definitely not be over-looked! There is definitely no shortage of talent at 152 but the favorite here is definitely Section 2 champion Zack Lawrence. The Duanesburg senior is a perfect 46-0 this season and won the Eastern States Classic by defeating Division 1 hammer Dan Mauriello. Lawrence finished 3rd in NYS at 152 last year and is anxious to finish his high school career as a state champ. To do so, Lawrence will have to navigate through some extremely tough wrestlers such as Mikey Squires from Section 4 Norwich. Squires is 39-4 but one of his losses was a 7-3 decision to Lawrence at the ESC. Squires finished 5th in NYS at 126 last year but is hoping to finish higher up here at 152. Matt Campo from Section 11 Mt. Sinai can not be overlooked! Campo is 41-4 this season and had a win over former NYS champ Hunter Shaut at the NYSPHSAA Dual Meet Championships. Two others to keep on your radar at this weight are Johnny Putney from Section 6 and the Section 9 champ Nate Ross from Onteora. Ross has been to the state tournament twice before and is a very dangerous match-up for anyone. Other to watch here include Austin Carmen from Section 8, Giovanni Schifano from Section 6, and Josh Mayden from Section 3. This weight class has a returning state finalist, a returning state 4th place finisher, and a returning state 5th place finisher who is undefeated this season….and none of them are the top 2 seeds! The #1 seed at 160 is Jacob Null from Dolgeville. The Section 3 sophomore is 38-2 this season and has wins over a few absolute studs including Corey Connelly, Jacob Nolan, and the #2 seed here Charlie Grygas from Duanesburg. Both of Null’s losses came at the Eastern States Classic where he finished 4th. One of his losses was to Cole Rees from Wyoming Seminary and the other was in the semis to the aforementioned Grygas. Grygas, 44-2, went on to finish 2nd at the ESC losing to nationally ranked Kyle Mosher. The 3rd seed here is Jack Chesman from Pearl River. Chesman was a state finalist last year and is 32-2 this season with both of his losses coming at the ESC. One of those losses was a 3-0 decision to Grygas. 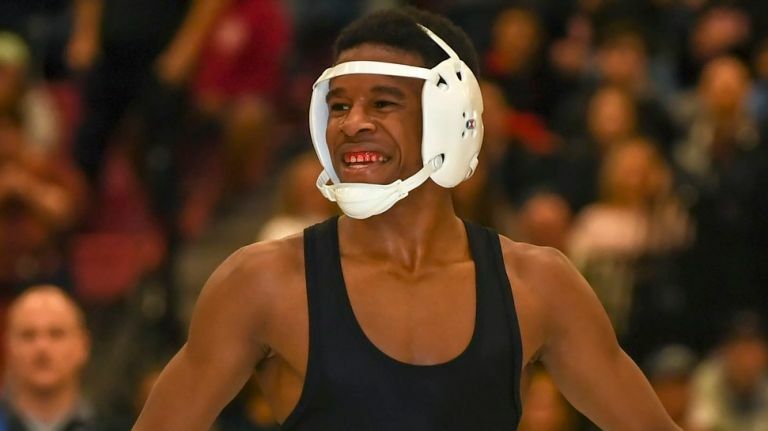 Corey Day from Section 6 Iroquois was 4th in NYS last year and is 40-3 this year and Lajess Sawyer from Center Moriches took 5th in NYS last year and is a perfect 25-0 so far this year. 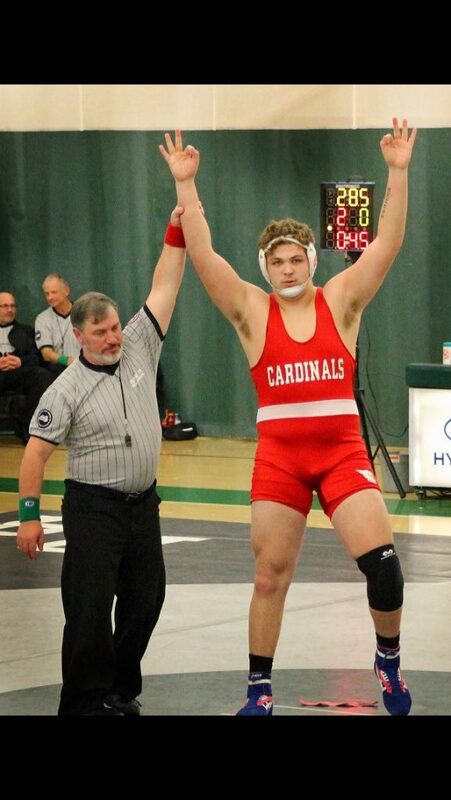 Sawyer is not the only undefeated wrestler in the bracket – Section 4 champ Shane Hoover is 39-0! Another one to watch here is the #4 seed Gavin Bell from Cold Spring Harbor. The Section 8 sophomore is 38-3 and has not lost to any wrestler in the bracket. A few others to keep an eye on here are Brock Conaway from Section 5 and Matthew McManaman from Section 3. 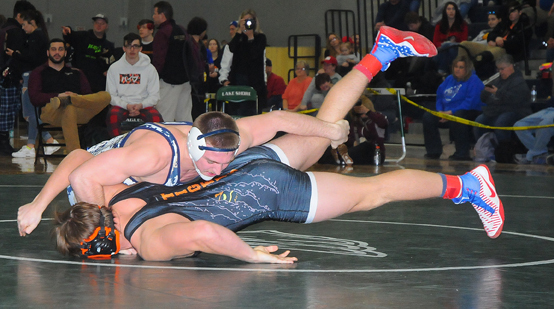 Section 9 champ Bryce Horner will gain some very valuable experience in Albany this weekend. Nolan, top, has over 200 career wins! Dempsey Carroll from Section 3 Copenhagen was the NYS champion at 152 pounds last year – and he is the #3 seed here! The top seed at 170 goes to Saranac senior Jacob Nolan. The Section 7 champ came is 2nd at 160 last year and is 35-4 this season. Of his 4 losses, 2 were by medical forfeit at ESC after he lost in the semis to state champ Ross McFarland 3-0 and then forfeited to 6th place. The 2nd seed here is Section 5 champion Sam Wolf. The Warsaw senior is 49-2 this season and both of his losses are the aforementioned Ross McFarland who is at 182 for the post season. One of those losses was at the Eastern States Classic where Wolf placed 3rd and posted wins over Division 1 studs Rogers, Illicete, and Serafini. He also had a win at ESC over Section 3’s Zach Williams who is a wildcard entry here after losing in the Section 3 finals to state champ Carroll. A few others to keep an eye on here are Brendan O’Hagen from Section 8, Wyatt Smith from Section 5, and Rich Forbes from Section 2. Section 9 champ Cesar Santiago is 22-8; he’s a tough wrestler and could definitely pick up a win or two this weekend. McFarland takes down S9’s Dillon Ross in the 2018 state final! Perhaps the heaviest favorite to win his weight class at this year’s Division 2 tournament is Ross McFarland from Section 3. The senior from Phoenix HS was a 2018 state champion at 170 pounds and has not lost a wrestled match this season. McFarland’s record is 40-1 with his lone blemish being a medical forfeit in the Section 3 finals to nurse an injury. McFarland won the Eastern States Classic at 170 in January but decided to go 182 for the post season. the wrestler he forfeited to at the Section 3 finals, Anthony Rasmussen, is the #2 seed here. Rasmussen has a 31-5 record and did lose to McFarland 6-1 at the S3 D2 Class B finals. 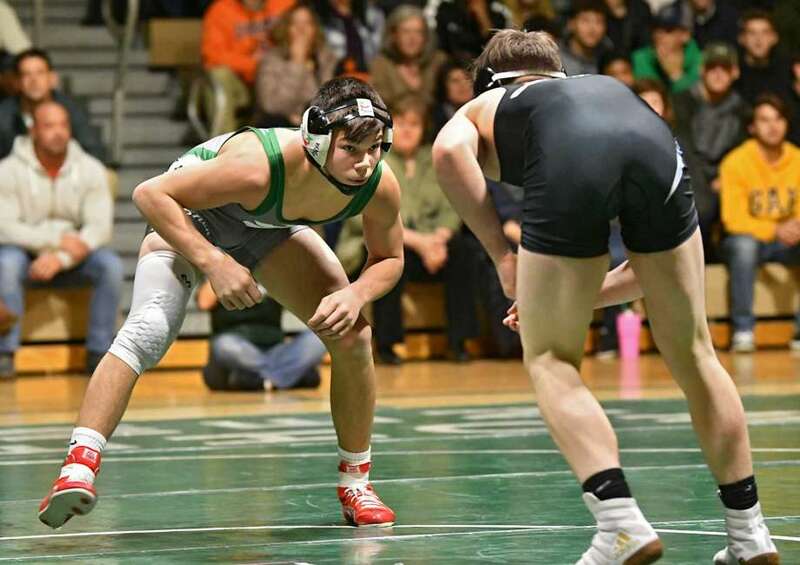 Section 1 champ Nicolas Meglino, who is 32-3 and is the 3rd seed, will definitely he it the medal hunt here as will Section 2 champ Cody York who is a perfect 40-0 this season! A few others to keep an eye on at 182 are Justin Vega from John Glenn, Blake Ilges from Canisteo, and Mitchell Knapp from Susquehanna Valley. Section 9 senior Drew Bendy is 19-9 but has a winnable match in the opening round against Pat Quinn from Section 8. With several wrestlers in contention for the title the 195 pound weight class will be great to watch unfold. Section 6 champion Robbie Penhollow is the top seed and definitely one of the favorites. The Falconer senior has a 45-1 record with his only loss coming to a wrestler from Ohio. From the other side of the bracket we could possibly see Nate DeGroff from Warsaw take on Penhollow in the finals. DeGroff placed 6th at 195 last year and is sporting a 47-3 record this year. One of his losses was to Penhollow, the other two were at the ESC. Section 2 has two high seeds in this bracket – Nolan McNeil from Warrenburg is the 3rd seed and Devon Shader from Coxsackie is the 4th seed. James DeAveiro from Section 9 is having a great season at 25-2 and could definitely be in the medal hunt as will Mike Sabella from S11 Mt. Sinai. We also shouldn’t overlook Jace Fillon from Northern Adirondack and Bryce Dare from Holland Patent. Mike Rigerman from Section 6 Pioneer is a perfect 39-0 this season and is the top seed and favorite at 220 this year. Rigerman finished 4th in NYS last season at this same weight. He will definitely be challenged by a few wrestlers in this bracket namely Keagan Carmenatty from Section 5. Carmenatty is 39-1 and he is the #2 seed at 220. Port Jervis junior James Oosterom is the 3rd seed here. The Section 9 champ is 25-1 and has a win by pinfall over last year’s D1 finalist Jhordyn Innocent earlier this year. The wrestler who definitely can not be overlooked in this bracket is 4th seeded Karl Osmono Bouyer from Section 8 Clarke. Bouyer is 35-1 this season but his one loss is to another wrestler in the field – Richard Serafin from Section 4 Oneonta. A few other to keep an eye on here are Connor Sykora from Section 5, Josh Greenwood from Section 3, Jeff Crooks from Section 2, and Chris Wilson from Section 2. The heavyweight division in Division 2 could prove to be one of the more exciting brackets in the tourney this year. The top seed and favorite is Trentyn Rupert from Section 4. The Newark Valley senior is 33-2 and finished 2nd at this year’s Eastern States Classic where he lost to nationally ranked Joey Slackman. His other loss was to the #2 seed in this bracket, Dylan Houseknetch from Section 4. Houseknetch pinned Ruppert in the Section 4 finals however the two have met 3 times this year and Ruppert pinned Houseknetch in the other two meetings. Section 2 champ Craig Sawyer is 35-1 this season and will definitely be in the hunt for the top step of the podium. Sawyer’s only loss this season was to an out-of-state wrestler and he has wins over Division 1 qualifiers Adam Fenner and Preston Havison. Sawyer may be tested in his opening match however when he takes on Patrick Ancewicz from Section 11 who is a perfect 30-0 this year. Others that we need to keep an eye on here are Jake DeWall from Section 5, Jake Rankin from Section 8, Dalton Criss from Section 7, and Mike Leibl from Section 3. Section 9 Champ Jason Lonstein from Ellenville has an out bracket match that he needs to win in order to pull him into the R16. Let’s take a look at a weight class by weight class breakdown of the 2019 NYSPHSAA Wrestling Championships. The tournament takes place on 2/22 & 2/23 at the Times Union Center in Albany, NY. The lightweights are always fun to watch at this tournament because many of the competitors here are young and they improve tremendously throughout the course of the season. The top seed and one of the favorites here is Anthony Conetta from Massapequa. Conetta sports a 44-1 record with his only loss coming to the #2 seed, Gregor McNeil from Hilton at the state duals. McNeil has a 28-1 record and guess who his only loss is to….yup, Conetta at ESC. There are several talented wrestlers who will have something to say about it! Sachem East’s Jared Weinhaus is 45-4 and will compete here as will Section 8 wildcard Killian Foy from MacArthur. Section 2 champ Jashon Holmes is 40-3 and has the potential to place high here as does the wrestler responsible for two of his losses, Angelo Centrone from Mahopac. Both Section 9 entries, Andrew Marchese and Colby Amell, will be competitive here as will Section 6’s 7th grader Cameron Catrabone who is 34-1 this season! Stevo Poulin from Section 2 Shenedehowa is the favorite here. Stevo was the 99lb state champ last year, he’s a 2X Eastern States Classic champion, and he’s currently ranked #2 in the nation by Intermat and #3 by FloWrestling! Poulin will not walk through this weight however! His opponent in last year’s state final, Chase Liardi from Section 8 Massapequa, is anxious for a rematch as is Minisink Valley 7th grader Zack Ryder. Ryder was teched by Stevo early in the season but closed the gap drastically by January and lost to him 10-3 in a match where he rode Stevo out the entire 3rd period! Hilton’s Rocco Camillaci was a NYS place winner last year and has only two losses this year – 1-0 to Liardi and 6-1 to Poulin – both at Eastern States. A few other to keep our eyes on here include Horsehead’s Zack Levey, Long Beach’s Jeremiah Echiverria, and Carson Alberti from Section 6. Section 9 wildcard Justin Morales has pushed Ryder twice this season and could surprise people here as may Central Islip’s Kwesi Amoa. The top seed and heavy favorite at 113 is Hilton junior Greg Diakomihalis who is a 3X NYS champion and is currently ranked #1 in the country by FloWrestling and #2 by Intermat! He is 51-0 and has scored bonus points in every match except one where he defeated 2X NYS D2 champ Anthony Noto 5-2 in the ESC finals. Diakomihalis is on a 162 match unbeaten streak. However…Greg D is not the only state champ in this bracket! Last year’s 106 pound champ Terry Adams from Monsignor Farrell will challenge here as will a wrestler who has beaten him this year, Luke Smith from Section 11 Hauppauge. Section 8 champ Josiah Encarnacion from Wantagh is a state placer and we should also watch out for Section 4 champ Dante Rigal. A few others to watch here include Jake Eckerle from Section 11 and the Sleezer twins Ryan and Dylan from Section 2 Queensbury. Section 9 entry Jacob Chenier is having a great season and may surprise someone in the bracket! The weight class is without question one of the most wide open in the tournament in either division. The top seed here is Jaden Scott from Section 5 Rush Henrietta. Scott, only a freshman, was the state runner-up at 106 last season and is 36-0 this year with a win over D2 state champ Marek Bush. One of the other favorites at 120 is Sean Carter from Section 11 North Babylon. Carter was a state place winner last season and is 36-2 this season. One of his losses was to D2 hammer Jordan Titus and the other was in the ESC finals where he dropped a decision to nationally ranked Sam Latona from Alabama. Latona’s closest match at ESC however came from a different wrestler in this bracket, James Ryan from Monsignor Farrell. Ryan lost to Latona 8-6 in sudden victory then wrestled back to 3rd place. There are a few other state placers here as well! 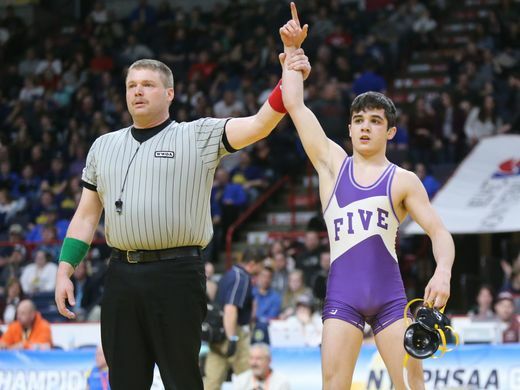 Monroe Woodbury’s Marco Vespa has finished 4th and 3rd at the last two state tournaments and Section 1 champ Ivan Garcia has also stepped on the medal stand in Albany. Vespa, however, needed an at-large birth to get in the tournament this year because he was picked off in the Section 9 finals by Minisink Valley junior Nick Picariello by a score of 6-2. Freshman Geoge Oroudjov from Section 8 Syosset will definitely make some noise here and will inevitably continue the legacy of his older brothers Nick and Vito Arujau. Let’s also keep an eye on wildcards CJ Lee (Section 5) and Amos Rivera (Section 1) as both have the potential to place at this weight! With a returning state champ, a returning 3rd place finisher, and a few other absolute hammers, 126 will be a great weight class to follow this year! 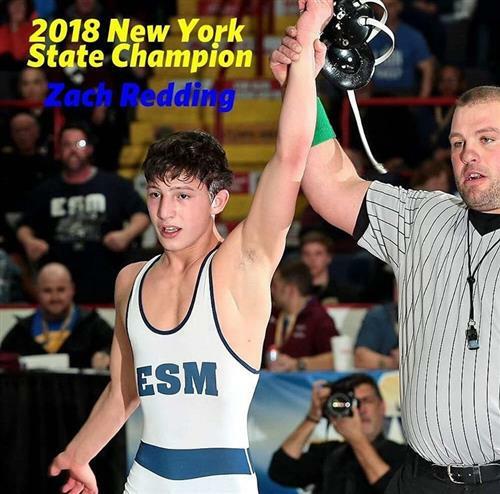 Top seeded Zach Redding was the NYS champ at 120 last year. He is 47-2 on the season and finished 3rd at the Eastern States Classic after dropping a 10-7 decision to Zeke Escalara from Wyoming Seminary. His other loss was up at 132 to one of the favorites there, Preston Maucere. Redding has wins a wins over a few of the wrestlers in this bracket including one of the other favorites Dennis Robin from Arlington who placed 4th at ESC. 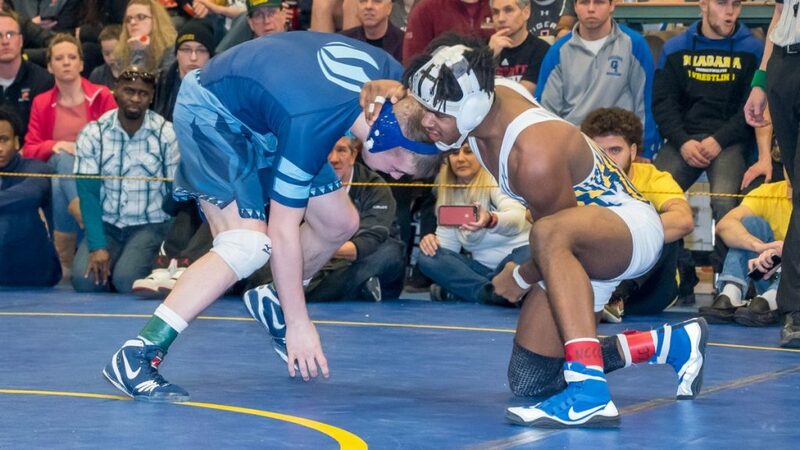 At ESC, Robin recorded an impressive 10-2 major decision over Section 5 champ Ryan Burgos for Hilton who will definitely contend here as will Tyler Kellison from Section 3 who placed 3rd in NYS at this exact weight last season! Kellison, however, was majored 10-0 by Burgos then lost to Marek Bush and he did not place at ESC! Aiden Rabideau from Clarence, Chris Cook from John Jay Cross River, and Alexis Diaz from North Rockland all needed wildcards to get to Albany however all three have the potential to place and we certainly cannot overlook Section 9 champ Jordan Suarez who is 34-4 on the season and is hungry for a spot on the medal stand! This weight class boasts a returning NYS #2, a returning NYS #3, and a returning NYS #4 – and it’s possible that none of them are the favorite! St. Anthony’s Preston Maucere is having an awesome season! The Catholic school champ is 37-4 and all four losses are to out-of-state wrestlers. Perhaps the most impressive result for Maucere this season was his 6-4 loss to Beau Bartlett of Wyoming Seminary who is ranked 3rd in the nation by Intermat! Maucere also lost 7-6 to St. Joe’s stud Sammy Alvarez who is also nationally ranked. One of the other favorites at 132 is Justin McDougald from Section 6 Niagara Wheatfield. McDougald placed 2nd in NYS last year at 126. He is undefeated this season and was the 2019 ESC champion at 132. Another one to watch here is Logan Sciotto from Section 11 Rocky Point. Sciotto has a 47-4 record and he finished 3rd in NYS last year at 113. One of Sciotto’s losses this season was to Section 8 champ Xavier Pommells from Uniondale who will definitely contend for a high medal here as will Alex Samson from Section 5 who placed 6th in NYS last year. Devin Woodworth from Section 4 placed 4th in the state last season and needed a wildcard to get to Albany because he was defeated by Drew Witham from Corning in the Section 4 finals. A few others to watch here are Mike Blando from Massapequa and Tommy Maddox from Washingtonville. Will Busiello be the next 5X champ? Eastport South Manor senior Adam Busiello is hoping to become only the 3rd wrestler in NYS history to win 5 state titles! Busiello is 46-0 this season, he won the Eastern States Classic, and he is ranked 4th in the nation by Intermat! So he’s clearly the huge favorite to win at 138 this year right? Not so fast! One of Busiello’s wins this season was a razor close 3-2 win over Willie McDougald from Section 6. McDougald, a junior at Niagara Falls, is 40-1 on the season and was the state champion at 132 last season! To many wrestling fans, this is the most highly anticipated match of the tournament! And just to make things a little more interesting we probably shouldn’t overlook Mason Wersinger from Section 5 Spencerport. Wersinger is 40-0 this season and is looking to surprise everyone by defeating one or both of the state champs in this bracket! 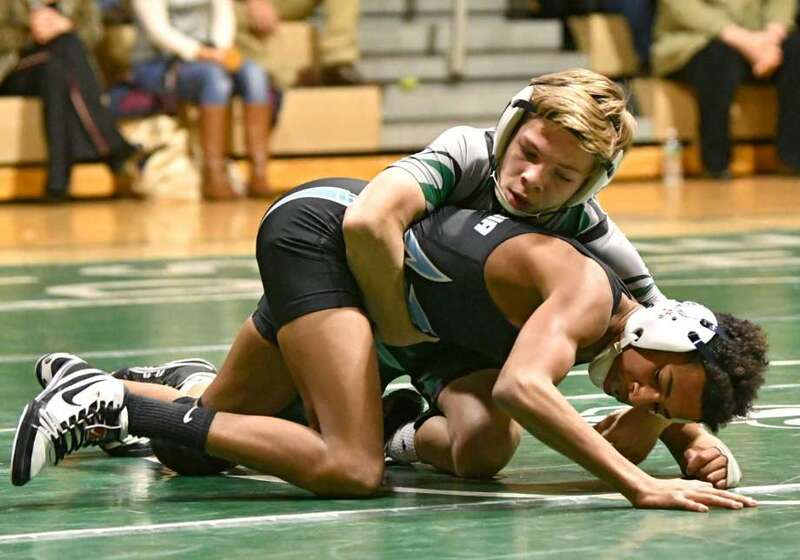 Others to watch at 138 include undefeated Kyle Althenn from Section 8 Mepham, state placer Chase Daudelin from Corning, Brendon Carroll and Tyler Albis from Section 1, Zacc Romero from Brooklyn Tech, and ESC placer Sean Savacool from Section 9 Minisink Valley! Although it is not loaded with returning NYS place winners, 145 is definitely one of the toughest weights in this year’s tournament! Without exaggeration, there are at least a half of a dozen wrestlers with a shot at winning this weight! Let’s start with Jonathan Spadafora from Section 11. The Half Hollow Hills East senior is 38-1 this season and came in 2nd at the ESC losing in the finals to CT hammer Tyler Sung by a 3-2 margin. Sophomore Brock Delsignore from Section 2 Shenendehowa has been to Albany before and is having a great year. AJ Kovacs from Iona Prep is an absolute hammer and could win it ill here as could Lee Mauras from Section 8 Freeport who placed 4th in NYS last season. Karamvir Hothi from Rush Henrietta and Jeremy Scuttalero from Massapequa both needed wildcards to get in – overlooking either one of them would be a huge mistake. Section 9 has two tough wrestlers entered at 145 in Tommy Askey from Pine Bush who grinded out a tough 3-1 win over Minisink Valley’s Nick Albornoz at the Section 9 tournament! This will be a great weight to watch unfold! Wide open – that is the best way to describe the 152 pound weight class at this year’s tournament! Section 11 champ and ESC finalist Danny Mauriello is definitely one of wrestlers to watch here. The Hauppauge junior is 39-2 and neither of his losses are to wrestlers in this bracket. Section 8 has two excellent entries here in Garret Gibbons from Massapequa and Joe Simons from Farmingdale. Gibbons defeated Simons 8-7 in the Section 8 finals. Do not be surprised if both place in the top 6 this weekend in Albany. Same can be said for Section 6. Warren McDougald, Jr. and Ryan Stencel are both hammers and will contend here as will Ty Raines from Section 5 Churchville Chili. Christian Hansen from St. Anthony’s has wrestled a brutal schedule and may be the most battle tested wrestler in the field. Section 2 also has two excellent wrestlers in the bracket in Sean Malenfant from Averill Park and Jacob Edwards from Columbia. Jason Scibek from Horsehead’s and Joe McGinty from Monroe Woodbury could also do very well at 152 this year! Kyle Mosher from Section 8 South Side finished a very respectable 5th in NYS last year….but what a difference a year makes! After an incredible off season, Mosher is now ranked in the top 10 in the nation by both Flo and Intermat and is considered by many the favorite to take home the title at 160 pounds. He will not be untested…far from it! Section 5 champ Cooper Kropman is a hammer! Still only a sophomore, Kropman finished 3rd at 152 in NYS last year and he is 30-2 this season. 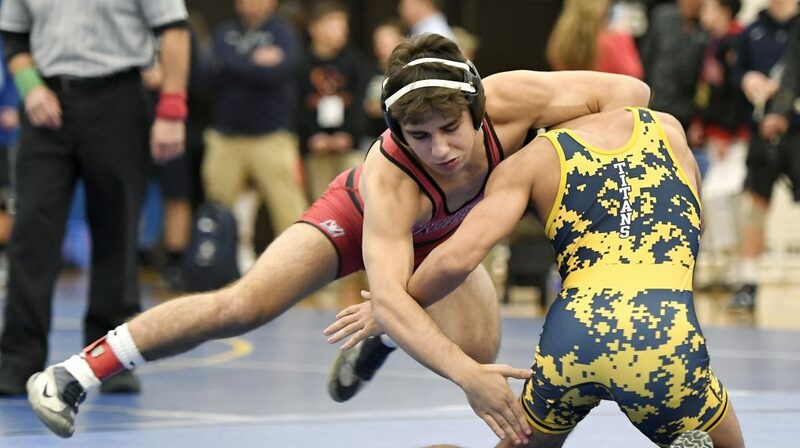 His only two losses came at The Powerade Tournament and one of the losses was a 4-2 sv loss to Ryan Vulakh who is currently ranked 3rd in the country by Intermat. A Mosher vs Cropman final could be an absolute war! 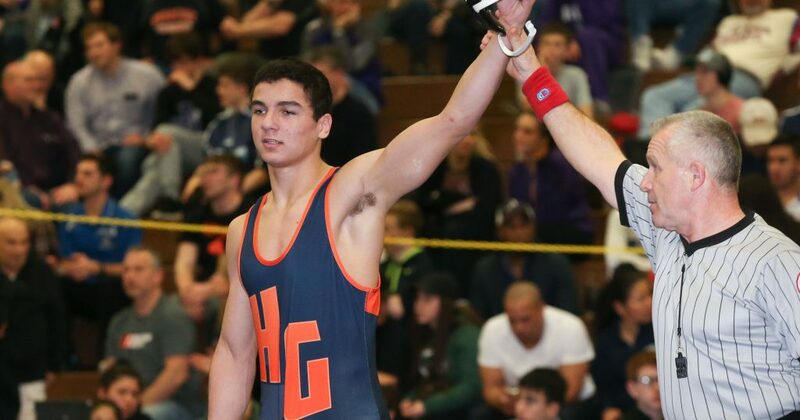 Adam Daghestani from Grand Island Section 6 is a perfect 46-0 this season and the #3 seed – he will definitely make some noise at 160 this year! There are definitely some other talented wrestlers in this weight and we should definitely keep an eye on such as Peter Mashkov from Niskayuna, Jackson Hulse from Westhampton Beach, and Steven Gazzillo from Cornwall! The 170 pound weight class is another meat grinder up in Albany! Section 1 champion Aaron Wolk is 41-1 this season and will definitely be one of the favorites. Wolk finished 5th in NYS last year and was an ESC finalist losing a 2-1 decision to D2 stud Ross McFarland. Some of Wolk’s wins at ESC however were razor close decisions over some of the wrestlers in his bracket this weekend, namely Matt Rogers, Paul Illicete, and Joe Gannone. Rogers is the Section 8 champion from Wantagh and lost 6-5 to Wolk at ESC. Illicite won the crown in Section 11 and he dropped a 7-5 decision to Wolk. Gannone from Eastport South Manor stayed withing 2 points of Wolk at ESC losing 6-4. Gannone actually finished 3rd in Section 11 because he lost to another contender here, Corey Connolly from Rocky Point who finished 4th in NYS last season! Another NYS finisher, JD Moore from Levittown Division, is tough as nails and so is Section 2 champ Jakai Townsend from Burnt Hills. A few other to watch here include Matt Bucci from Saugerties, Josh Thibeault from Niagara Wheatfield, and Jeff Geller from Staten Island Tech. Perhaps one of the heaviest favorites to win his weight class in the tournament is Section 1 champ Jake Logan. The New Rochelle senior is a perfect 36-0 this year and he is the defending NYS champion at this weight. Logan, who will be wrestling at Lehigh in the fall, is a 2X ESC champion and is currently ranked 8th in the nation by both Intermat and Flo. Logan will definitely be tested though! Fombo Azah from Carthage is the 2nd seed and he is having a great season which includes a runner up finish to Logan at the ESC. The one opponent who Logan has not teched or pinned this year is Eduard Dzhioev from the PSAL who is also in this bracket. At the Eastern States Classic, Dzhioev lost a 4-2 decision at ESC to Angelo Petrakis from Massapequa who is definitely one of the contenders here. Section 9 champ Tyler Serafini is making his second trip to the states and definitely has the ability to get on the podium with a medal! Some others to watch here include Michael Tyrell from Hauppauge, Liam Mooney from Colonie, Joe Cocozza from Penfield, and Connor Kenney from Grand Island. There is a lot of talent entered in this weight class however Hilton senior Sammy Deprez has to be considered the odds-on favorite to take the top step of the medal stand on Saturday night. Deprez, who is 40-0 this season, finished 3rd in NYS last year and is currently ranked 9th in the nation by Intermat and 17th by FloWrestling. Deprez’s biggest challenge will likely come from either Jhordyn Innocent from East Ramapo, a state finalist last year, or Matt Kelly from Iona Prep. Both wrestlers lost to Deprez at ESC but they are very talented wrestlers who have the ability to push him in a rematch. A few other wrestlers to watch here are Liam McIntyre from Westhampton Beach, Matt Hegi from Mepham, Sam Santander from Monroe Woodbury, and Todd DeGroat from Vestal. The favorite and top seed at 220 pounds is Will Leonard from Section 9. The Buffalo bound senior is undefeated this season and won the Eastern States Classic in January. 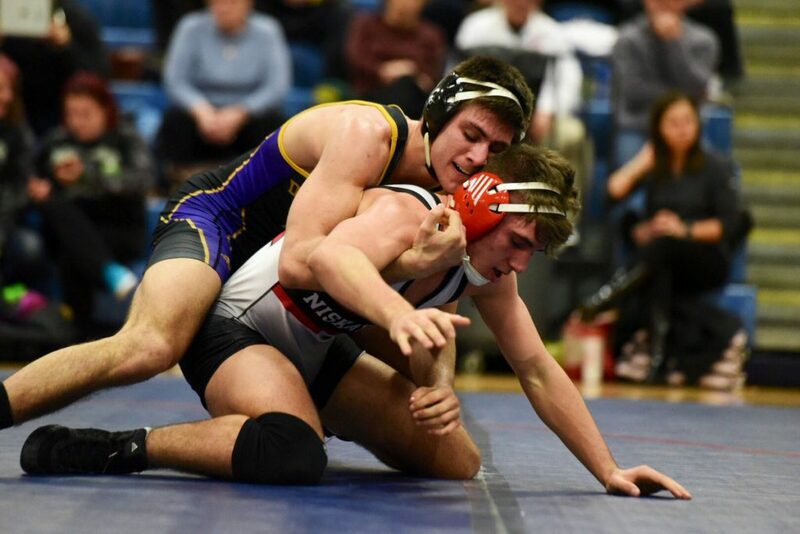 If Leonard, who placed 6th in NYS last year, is able to advance to the finals we could possibly see an all Section 9 final pitting Leonard versus NFA junior Maxx DeCapua. DeCapua, who finished 6th in NYS at 195 last year, received a wildcard after losing to Leonard 5-0 in the Section 9 finals. Section 4 champ Lucas Scott is having a great sophomore campaign at 31-1 and will definitely will be in the mix here as will ESC finalist Dylan Gianikos from Pat-Med. Emre Mabocoglu from PSAL cannot be overlooks and the same can be said for Section 8 champ Dequan Stewart from Roosevelt. We should also keep an eye on Nick Serce from Irondequoit in Section 5 and undefeated Nik Koch from Averill Park in Section 2. Commack senior Joey Slackman was the runner-up at 285 in Albany last year and he is poised to take the next step to the top of the podium this weekend. Slackman, who is nationally ranked in the top 20 by both Flo and Intermat, is a perfect 42-0 this season and will be wrestling for Penn in the Fall. This is not a one-horse-race however as there are several talented wrestlers at 285 including 2nd seed Jake Stangle from Ballston Spa and 3rd seeded Adam Fenner from Minisink Valley who is only a sophomore! We also need to keep an eye on both Section 5 entries – Colton Crane from Gates Chili and Collin Burns from Hilton. Section 9 wildcard Preston Havison is dangerous as is Collin Null from Carthage and Myles Norris from Freeport.